Caterpillars are “worm” like larval stages of butterflies and moths. They typically feed on grass, plants, shrubs or trees and in the yard can cause a lot of damage. In some cases their nests are unsightly but with some species, there is no nest. The bottom line is that active active caterpillars can become a significant problem for any homeowner regardless of the species. This article will cover various treatments effective on any type of caterpillar so you can eliminate them in the yard or on the home. Caterpillars can range in size from 1/4″ to over 4″ in length. Colors will vary too depending on the species. Many are green to help blend in with the landscape but its not unusual to have black, spotted, red, orange, yellow and even blue caterpillars. Like most insects, caterpillars hatch from eggs. These eggs could have been laid in late fall from the previous year or they could have been deposited in early spring from hatching pupae. Though barely noticeable during this young stage, they will become active as local plant life starts to grow its spring foliage. It is this foliage the caterpillar larva need. 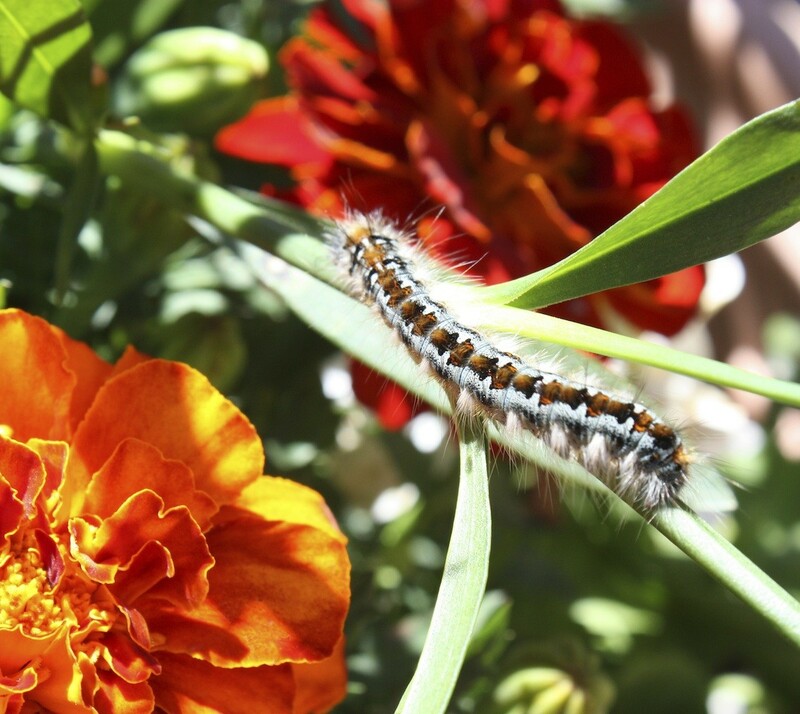 Caterpillars will eat what they can find and if the host tree or shrub on which they originate does not provide adequate food, they will migrate to local plants. For the next 1-2 months, the larva will feed during the day growing bigger and bigger. By the end of June or early July, feeding larva will have reached maturity and will instinctively want to pupate and become adults. Where they pupate is random; it could be on a tree or shrub but its just as likely to be on a home. Its during this migration that they will commonly crawl on homes and can become a problem inside living spaces. At first they will be seen on the sides of homes. And once a comfortable location is found where they feel safe and protected, they will spin their cocoon and undergo metamorphosis. In another 2-4 weeks they will emerge as adults, find a mate and reproduce. Females will begin the cycle again looking for a suitable host plant on which to lay eggs and once found, will leave 200-300 eggs on a branch held together with a sticky substance which is part of the egg laying process. Adults will then die off and the eggs will either hatch in the same season or rest till next spring and start anew when the weather is best suited for their survival. Caterpillars can do a lot of damage when they feed. Though their feeding only defoliates host plants and rarely causes immediate problems, plants which loose a lot of leaves will suffer later in the growing season. Besides looking odd with no leaves, they won’t be able to perform normal photosynthesis, they will have to spend a lot of time and energy growing new leaves to replace those which were lost and because of this, will be a lot more vulnerable to other problems like disease and parasites. In general, its not good to let caterpillars have their way when they identify a plant on which to feed. Furthermore, caterpillar droppings will be found underneath host plants and will make a mess on cars or furniture. They eat a lot and consequently, they defecate a lot. These droppings will be found under any host plant and can become quite an issue if a large local population is feeding. And since they’re acidic, droppings on a car or furniture can cause scarring as well as discoloration. Be sure to wash away their mess if you want to avoid cosmetic issues. 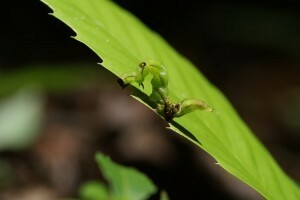 And if the damage and droppings isn’t enough to make these insects a bona-fide nuisance, their migrations surely will. These migrations will occur at the end of a larval stage. So once larvae have enough to eat, they will crawl off to find a good location where they can undergo metamorphosis. This last stage is a kind of semi sleeping stage where they won’t be moving or feeding. They like to choose secure and discreet locations for this change and seem to like man made structures just as much as any tree. It is not uncommon for any one house to have hundreds of these pupating caterpillars if left untreated. Now how often this happens will vary from species to species along with the region; some may have 2-3 cycles a year and others just one. But once the patterns are established and your home gets marked as a good place to pupate, the odds are high this will happen every summer and fall unless you take corrective action to get rid of the active population. 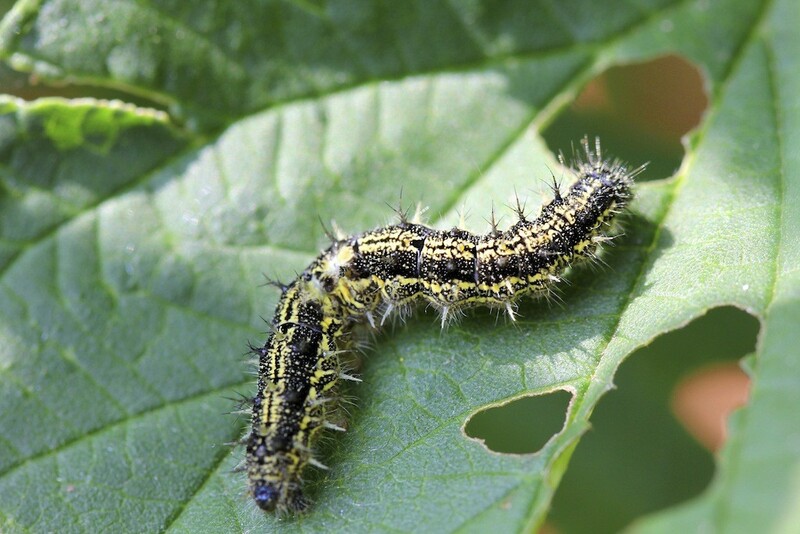 Fortunately, there are some very effective treatment options for controlling caterpillars. The most basic spray is THURICIDE and is nothing more than a concentrated bacteria. Though harmless to man or other animals, caterpillars which eat plants that have been sprayed with Thuricide will die after a few days. Thuricide can be sprayed on any plant, vegetable or fruit without posing a hazard and is a good preventive material to use – especially if you are treating before they arrive. 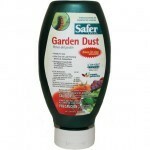 Mix 1 tablespoon per gallon of water and use the mixture on any flower, shrub, tree or bush when caterpillars are seen. Thuricide can be applied as needed; treating once a week is recommended when you see activity and you should continue to treat until they’re gone. One pint of Thuricide can make up to 32 gallons of mixed material and each gallon can cover 500-1000 sq/ft of plant foliage. Use 2 oz per 50 sq/ft of plant foliage and retreat once a week. The 8 oz jar can treat up to 200 sq/ft. 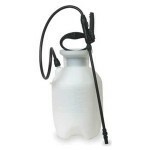 If you prefer a spray, go with either the MULTI PURPOSE INSECT KILLER. The Multi Purpose is one of the strongest organic concentrates we offer and will work for most any insect. Mix 6 oz per gallon of water and retreat as needed; usually once a week will keep caterpillars under control. If you already have caterpillars feeding and if they’re not targeting a vegetable garden, you may want something a little stronger. No doubt a more traditional product like BIFEN will yield great results within an hour. This concentrate should not be used on food crops but its excellent for all on flowers, shrubs, trees and the home. It’s odorless and will both kill quickly and last a long time. Bifen treatments will last up to a full month and will take care of just about any pest that may want to forage on your plant. It too will tend to repel nuisance or destructive insects. Mix 1 oz per gallon of water and expect to get 1,000 sq/ft of coverage per gallon of mixed material. One treatment should knock off most activity but if you still see any a week later, treat again. After that, once every month to make sure they don’t return. 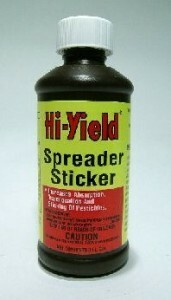 Since caterpillars are well protected, you’ll need to add SPREADER STICKER to your tank mix for better impact. 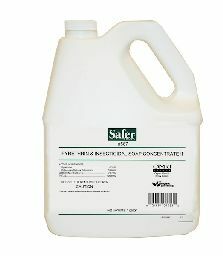 This additive will allow the concentrate to better coat the target plant and active pests. When spraying plants, its usually hard to get good coverage because leaves have undersides that will mostly avoid direct spray. And since caterpillars like using this bottom side, its extra important to get this area too. Any good PUMP SPRAYER can be used to apply the Bifen and Spreader Sticker. Just make sure its able to spray a good wide swath and reach the required height needed to get all caterpillar activity. If your home has been penetrated by migrating caterpillars, you’ll need to treat inside with a fast acting crack and crevice aerosol. DFORCE is well suited for this need. It comes with a straw tube injector so you can get the product where needed. Be sure to treat all baseboards, around windows, doorways, etc. Treatments will work immediately and all inside activity should stop after 1-2 days. Now if you don’t treat early enough, expect to see a lot of adults hatching out of pupa cocoons in another month or so. And in general, hatching adults will take 1-3 months to be “used up” so the problem inside could linger into the winter. Caterpillars are generally a harmless pest. However, their chewing and eating can cause damage and stress to a lot of trees and plants once they start their spring feeding. Keep them under control to avoid having them active every summer and fall by following the recommended treatments listed above.